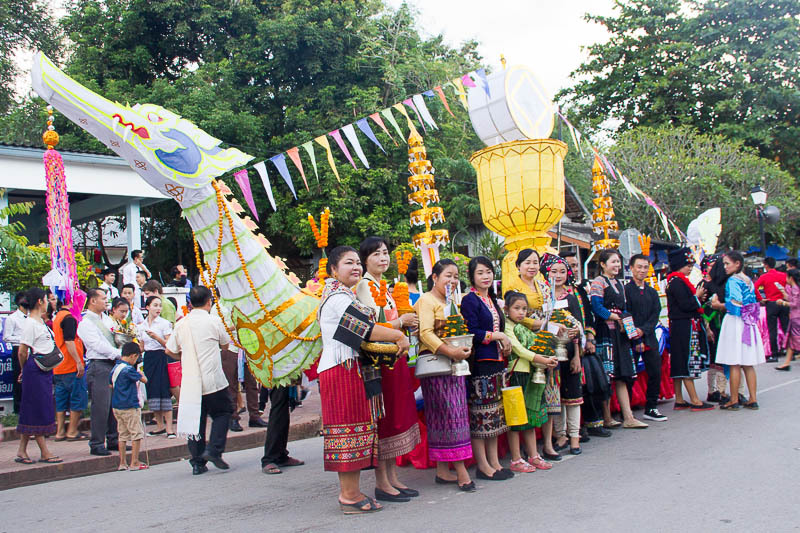 We were so lucky that our trip to Luang Prabang coincided with the Boun Lai Heua Fai Festival. We had no idea about this festival when we booked the flight ticket. We have never attended any festivals when we travel overseas, so this experience is truly one of a kind for us. 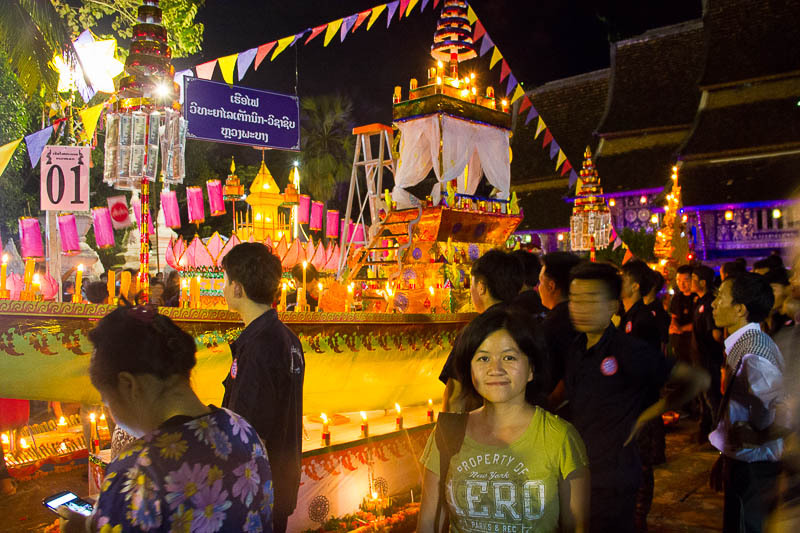 If you’re planning to visit Laos for the Boun Lai Heua Fai Festival, or if you’re weighing whether it’s a festival worth visiting, read on as I share my experience at Luang Prabang’s Boun Lai Heua Fai Festival in October 2017. One of my favorite boats! 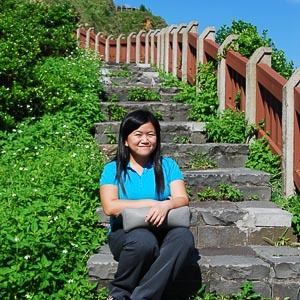 What’s Boun Lai Heua Fai? 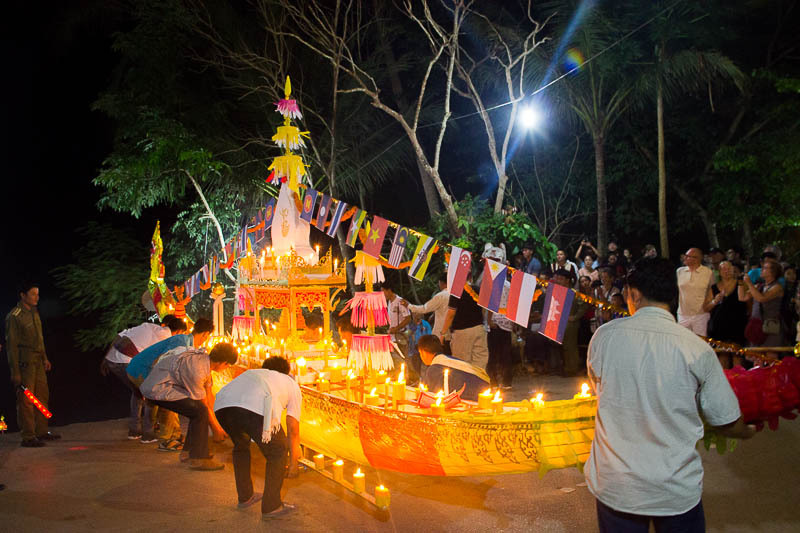 Boun Lai Heua Fai, also known as Festival of Light Boats, is a homage to the Mekong River, the Mother of All Things. It is hoped that the nagas (water spirits) will bring good luck to the residents. 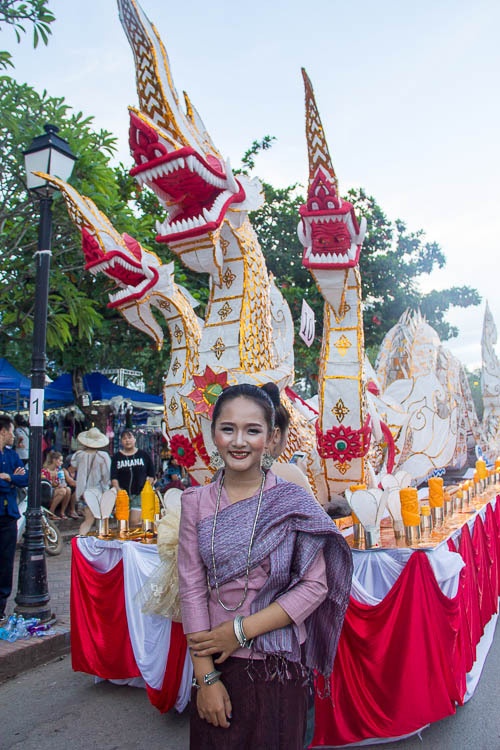 Lao people build and decorate boats on the days leading to the Festival. 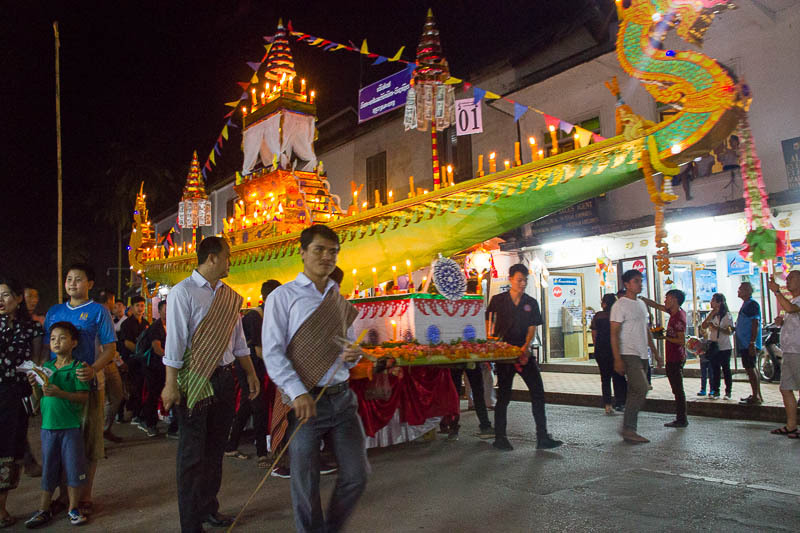 At the night of the Festival, the boats are lighted up, paraded through the town, and eventually launched onto the Mekong River. The date of the festival changes every year. To find the exact date, visit Tourism Luang Prabang website. 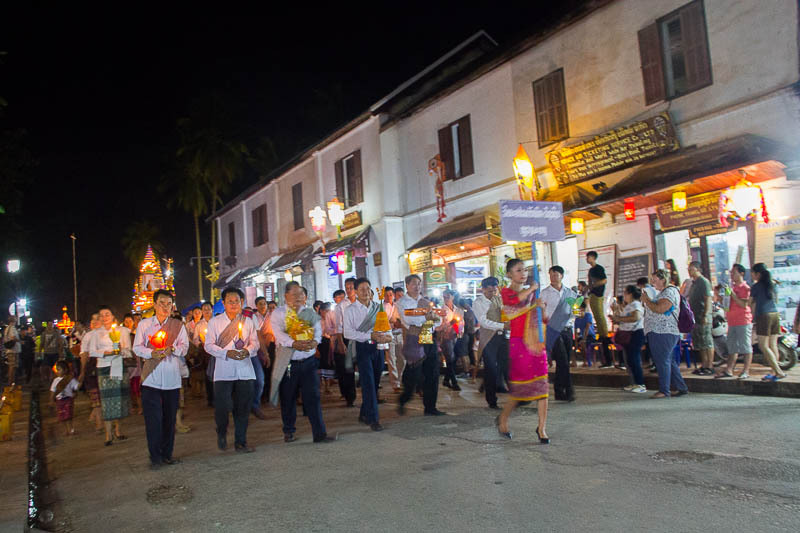 In 2017, the year we visited Luang Prabang, the Festival was held on Friday, 6 October 2017. The website wrote that the parade starts at 6pm. But actually, the boats started lining up at 5.30pm, but the parade only started at 7pm. 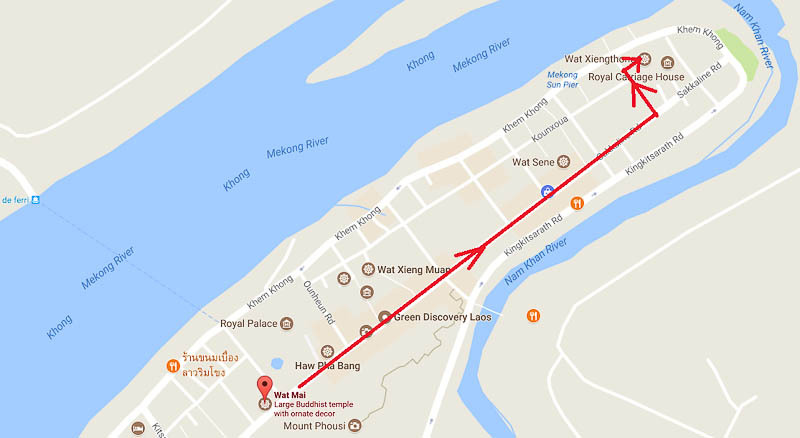 Starts at Sisavangvong Road (aka the main street) in front of Wat Mai, and ends at Mekong River near Wat Xieng Thong. As a tourist, we participated as a spectator. Basically, we just turned up at the main street at 5.30pm. 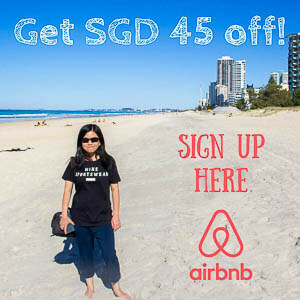 No registration is required. 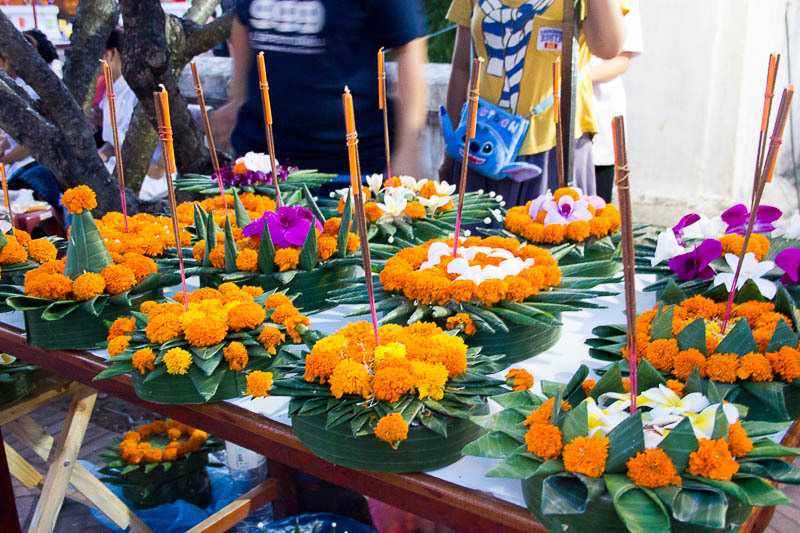 If you want to make offerings to the river nagas, you can purchase a handmade offering from street vendors, and release it to the river before or after the parade. Cameras or action cameras will come in handy if you want to preserve your experience. Also, do not forget to hydrate as you’ll spend a lot of time walking and waiting. 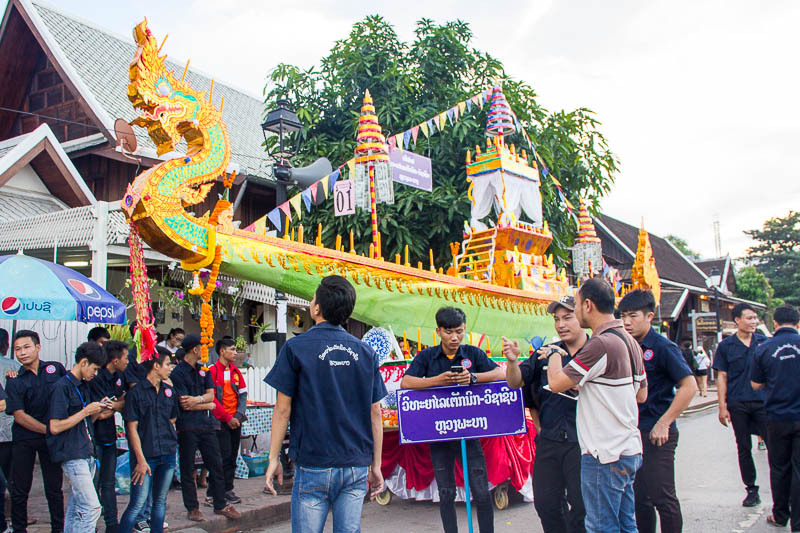 At around 5.30pm, the decorated boats have started lining up along Sisavangvong Road. All the participating boats have a designated number. The first boat lines up in front of Wat Mai, facing east. The second boat lines up behind the first boat, and so on. As the sky was still bright, we used the opportunity to take photos of the boats. We were surprised to find that AirAsia also has its own boat. That’s a great marketing strategy! All the boats were so huge, they needed to be carried by at least 10 people, I guess. We thought the parade would start at 6pm as mentioned on the website, so we patiently waited. The main street was closed for cars; however, several cars that bring elite guests were allowed to access the main street and drop the elites at the National Museum. Eventually, at 7pm, there were some announcements in Laos language that we couldn’t understand. A firework followed shortly after from opposite National Museum. Then, the parade started. Now, the sky has turned dark and the boats were all lighted up. 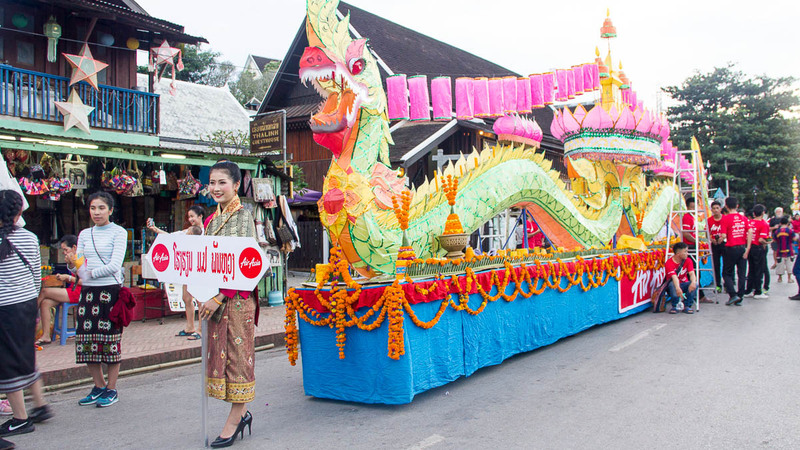 The parade moved from Wat Mai to Wat Xieng Thong along the main street. During the parade, several locals in the parade performed dances and theatrical acts. 30 minutes later, at 7.30pm, the boats turn left into a small road leading to Wat Xieng Thong. The narrow road slowed down the parade into a crawl. 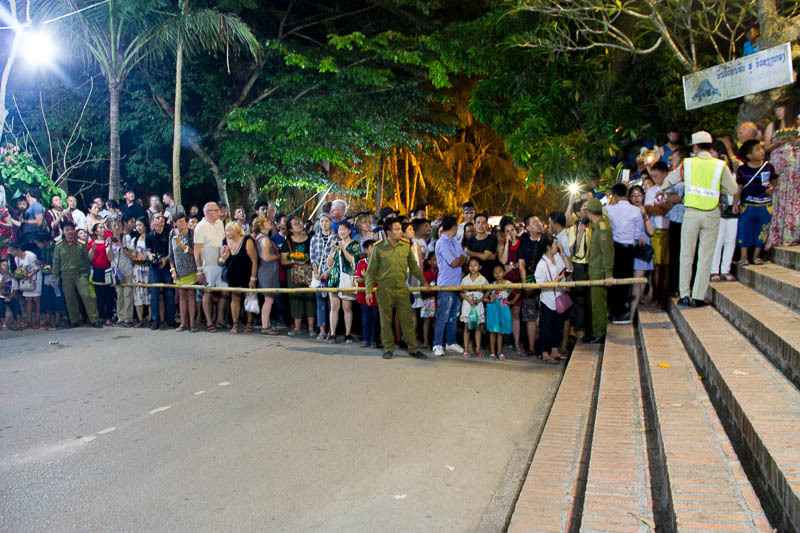 Then, all boats entered the Wat Xieng Thong compound and queued near another gate facing Mekong River. We thought that the boats would be launched to the river soon after they arrive at Wat Xieng Thong. 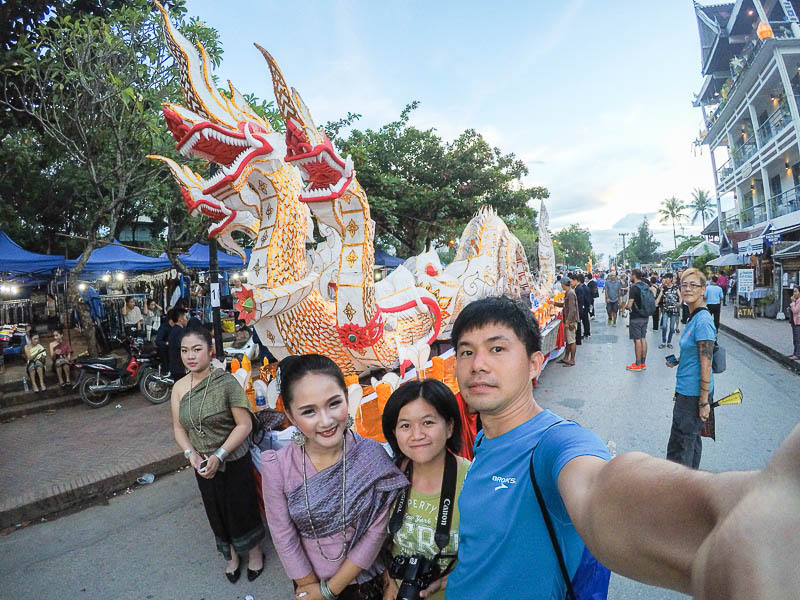 We got ourselves ready and stood at what we thought was a strategic location along the staircase leading down from Wat Xieng Thong to Khem Khong Road. We couldn’t be more wrong! We waited, and waited, and waited but the boats were not going down. And the staircase was getting too crowded. 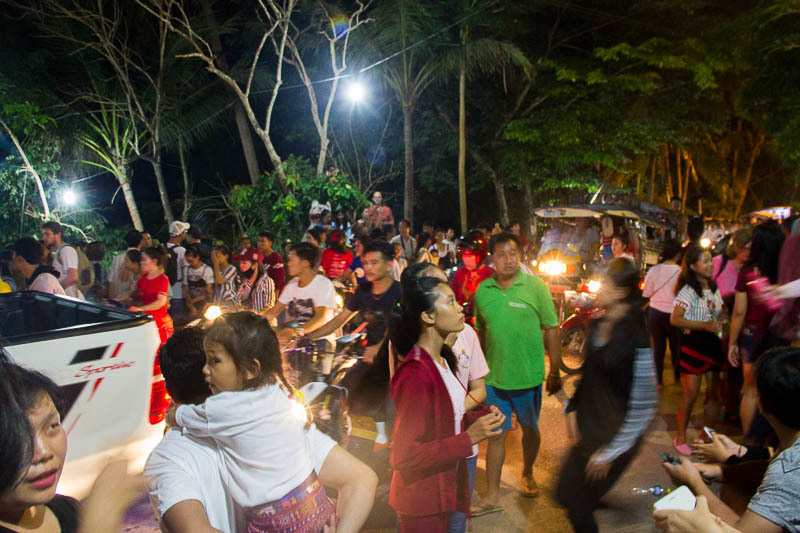 Khem Kong Road, the road between the Wat Xieng Thong’s staircase and Mekong River was so busy with traffic. The authority didn’t close this one-way road from the public. The road was so chaotic. At one point, a tuk-tuk broke down and it caused a jam on this busy road. The driver had no choice but to push the tuk-tuk that carries 2 adults by hand. If I were on that tuk-tuk, I would’ve felt so awkward and I’d go down from tuk-tuk. Hubby was hungry and wanted to leave the place. But I didn’t want to leave because we’ve come this far and we’ve waited this long. Finally, at 9pm, the security officers blocked the incoming traffic. 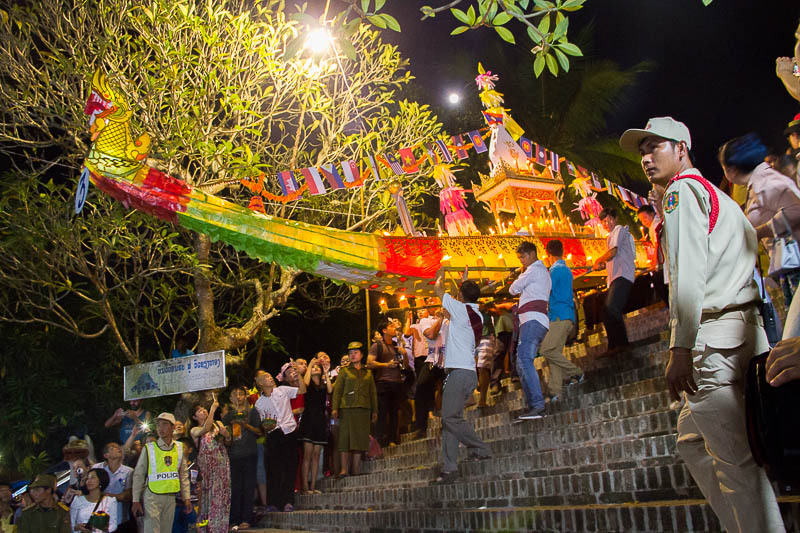 Then, the first boat made its way down Wat Xieng Thong’s staircase, crossed Khem Kong Road, and was launched to the river. One by one, according to the number sequence, the boat made their way down. My heart was pumping as I watched the boats came down the steep staircase while trying to avoid hitting the overhead cables. It looked like they’re quite experienced in the whole procedure of launching the boats. After the third or fourth boat was launched to the river, we felt that we had enough. We were tired of walking and standing, as well as hungry. We walked back to our guesthouse and had our long-awaited dinner. What a night! Would I Recommend Going to the Festival? Yeah! I don’t see why not! 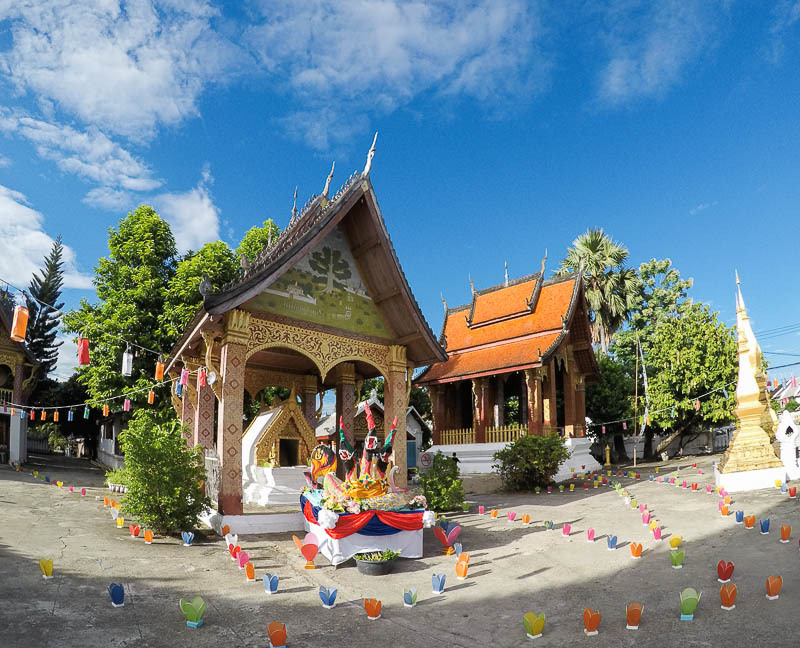 People on the internet were saying that the festival is bigger in Luang Prabang than in Vientiane, so the next time you’re in Laos during the festival, I’d recommend you go to the festival in Luang Prabang. It’ll be great if you could arrive a few days prior so that you could see the boats being decorated. There will be a lot of waiting time involved, be prepared for it. Sit down somewhere and conserve your energy, don’t be like us who stood for hours and made wild guesses about when the boats would make a move. 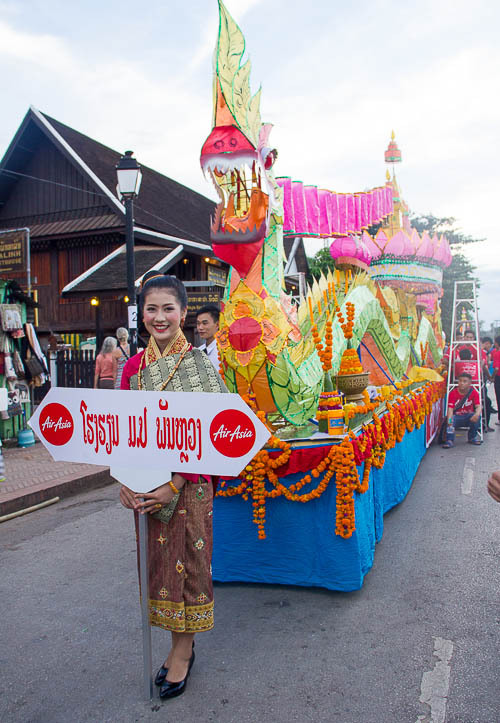 The Tourism of Luang Prabang created an awesome video of the Festival. Check their video below. A really cool blog post! We loved Luang Prabang; must’ve just missed the festival. Did you see the rest of Laos? A beautiful country right? Thank you! Yes Luang Prabang is such a great city! Sadly, we didn’t venture outside Luang Prabang due to time constraint. Would love to visit the rest of Laos in the future though! Laos is just so raw and beautiful! Maybe next time, it’s a really great place to visit. Definitely see Vang Vieng!